My tubulars are glued, and travel plans are set. After riding with Missoula folks this week the general consensus seems to be nerves and unknowns. I love it. It's too early to predict whether or not he or she is the one to beat, but I'm sensing that lots of riders think that there has been a leveling of the playing field. Maybe, it's because it's the first race and everyone has "hope" of being a contender. Particularly, in the podium chances for the men, and the overall winners for the women. That said LCurry's recent results make her a favorite anytime she's racing in our region. Same needs to be said about John Curry after his impressive Rad Racing and Cross Vegas. On the guys side I can only speak for the Missoula crossers, but Toby, Alex, and an emerging number of new cat 3's could make the 1-10 places very exciting. Also, I know that master Grove has been on form for most of the late summer and plans to make a run this season. Another Flatheader back for more is Benny Parsons. He's been living off of the endurance mountain bike stuff this season, but don't count him out for the podium in any cross race. The Montana Velo crew always has 2-4 potential winning cross racers and you know KV has been racing. Last year GAS had the best cross season. With Lussier, Flurry Curry, Bad Brad, Thomas, and JDelmue in the 4's......you've got consistent performers. They also bring cross wild cards to the table like Frykmania, Seb, and any of the MSU guys. Who's going to emerge for the ladies. Slivka, Dowd, and Curry all did early season races and looked strong. Last year's Rolling Thunder champ AFrykman should be around. Gaskill has committed to some racing this year as has the prodigy. Lot's of ladies will be trying cross for the first time this year, and there's no telling who could emerge from that group. Butte Cyclocross - Are you ready? The Montana Cyclocross season opens up this weekend with the much anticipated Psychlo Cross night time race. Sunday, everyone will move over to the traditional Butte Sports Complex course. I'm expecting a big turnout with Butte's proximity to Bozeman, Helena, and Missoula. I've said it before on the blog, but super props to Warren Smith for creating the first annual Psychlo Cross. What should you expect out of the races this weekend?? 1. Your bike is either going to work or not work. Don't pull a "we'll see how she holds up in the race." Cross is a rough sport, and your equipment has to be ready to handle it from day 1. 2. Some racers will be flying. As cross grows in Montana so does the level of competition. Some racers will come into weekend one with guns blazing. If that's not you, don't get frustrated, be patient and keep racing. This weekend should be a blast. To save $5 sign up online by clicking here. Check out the result above. Do you recognize a name in there?? Karl Vanderwood staying on the lead lap with Treefarm, Sheppard, and Page. This is from the Thrilla Cross Series in Bend, OR. Last year Karl was the rookie of the year in Montana Cyclocross. He finished last cross season strong with a 6th at Helena High and 9th at State Champs. After a full road season in his legs Karl is looking strong coming into cyclocross. This MT Velo rider is part of a strong contingent of up and coming MT cyclocross racers. This group is training specifically for cross and starting to travel to bigger racers. The Curry's will be hitting as many major races as their mini van can take them too. Bob P has found a passion for cx and focuses most of his cycling time towards the sport. Patricia Dowd, and Amy Frykman travel to bigger races. I think PDowd would tell you cx is her season. This growing passion and focus on cyclocross helps grow the sport in Montana. Pulling into the parking lot at Marymoor park at dusk and the first thing we hear is the announcer calling for staging for the cat 3 men’s race. Big turn out as usual. I had my eyes open for the color blue o f the MT Cyclocross boys. I quickly found Bob Presta lined up at the back of the field in row eight which meant he was starting in the 40’s. After a quick hand shake with Bob the one minute to start was given so I backed off and turned on my camera. At this point in the evening the cross course was in absolute prime condition and the cat 3’s started real fast. Bob wasted no time in moving from the 40’s to top ten in a matter of a couple of lap’s. Very impressive! He rode a great race and kept moving up each lap to grab 3rd place on the day. Best ride of the night for me. Jesse D rode well but I didn’t get a chance to see where he finished. Next up was the elite woman. Darkness was setting in and Lisa Curry was lined up with some HEAVY hitters. Helen Wyman from Great Britain, who is ranked number 8 in the world jumped into the lead early with a small chase group of the three girls close behind with Lisa chasing hard with another small group. Lisa rode a tough race on a course that started dry and tacky and finished with increasing rain and slick conditions and finished in 14th. Next up the elite men. This race was stacked to say the least. European heavies from Denmark and Switzerland along with the usual suspects on the domestic scene took up the first three or four rows. Bozeman’s John Curry was knocking elbows with some fast crossers in the tough conditions from the git go and was mid pack on lap one. Moving up during the heavy rain and slick conditions got harder as he found himself on the deck crashing and passing for the early portion of the race. He finished muddy and raring to go for day two. I spent most of the race in the pit’s taking cover from the heavy rain in the neutral support tent. Just like last year Starcrossed was held under rainy skys and day two at the Rad Racing GP just south of Tacoma took place under sunny sky’s. Cudos to Jesse Dolll who was called up for 5th place in the cat 3 men’s race just as I was coming back from a bike ride around the park. The womans race looked to be of similar size to last night and the separations happened very quickly. By lap two Sue Butler was off the front with groups of one’s and two’s chasing hard. Lisa Curry showed great consistency this weekend and battled in and out of the top ten for most of the race. She had a great sprint at the finish to come in 11th on the day. The men’s elite race was equally stacked. I had a feeling John Curry was due to make good on some frustration from last night. After a viciously fast start down the paved 400 meter paved beginning section it was single file with gaps opening up early. John came by me on lap one in the 40’s but put on a great show and raced himself into the 20’s by the end. After finding his place during lap three and four he kept picking off riders for the entire second half of the race. His last pass happened just before the finish to come in 26th on the day. Like always Montana racers showed they come to race and the start of the cross season got off to a very entertaining start here in the Northwest. I have a feeling if I was able to find myself at Rolling Thunder next month it would be right up there with the courses and entertainment I saw this weekend. Looking forward to hearing the stories. Jesse Doll 5th place cat 3'a. John Fiore 3rd place masters 1/2. Great night for Montana Racers and regional heros. From initial reports and scoping results it looks like the two best MT results were Lisa Curry's 14th in the Women's Elite Race, and Bobby Presta's 3rd place in the cat 3's. Curry's 14th is a good sign for what's to come on her cyclocross road trip. John Curry placed 41st in the elite race. I don't have a race report, but I'm sure John gave it everything he had. At that level, one bobble or bad starting position can pretty much kill your race. 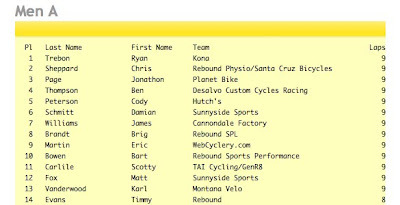 Confirmed Rolling Thunder participant Craig Richey placed 11th in the elite race beating out Wicks and Driscoll. Looks like it's shaping up nicely for Rolling Thunder between Krieg, Richey, Schultz, and the Montana all stars. Vertical Earth racer Jenni Gaertner place 9th in the women's elite race. Gaertner raced the Montana State Champs last year and we hope she comes to Rolling Thunder.